Although it is now February, almost March, the language ranking numbers below were actually run in January in keeping with our roughly quarterly pace for updates. As we have done since 2011, we’re repeating the analysis originally performed by Drew Conway and John Myles White in December of 2010. Measurement of performance depends, of course, on what you measure. 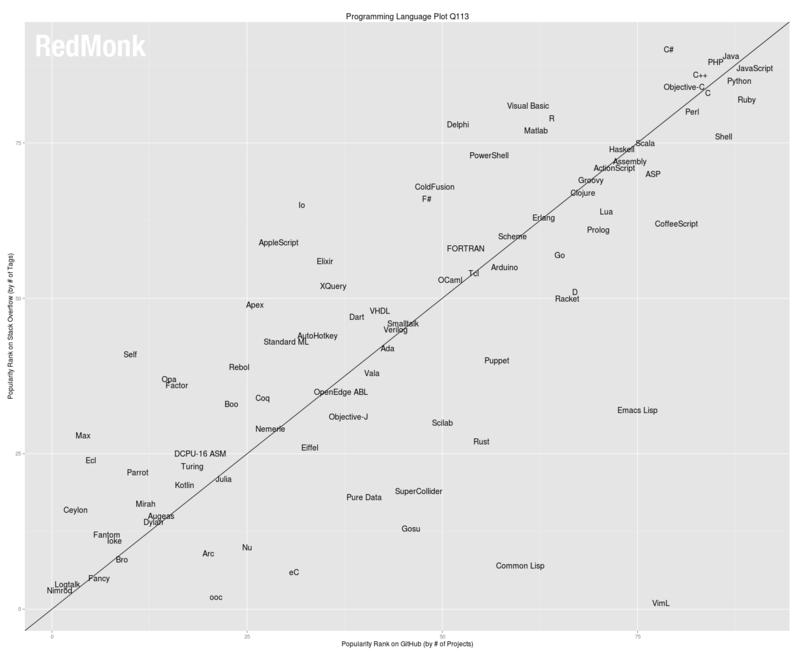 In this case, the rankings are derived from a correlation of programming traction on GitHub and Stack Overflow. While there are many approaches to measuring language performance, none perfect, GitHub and Stack Overflow collectively represent statistically significant volumes of data. More importantly for our purposes, their respective communities, while overlapping, remain distinct and thus provide some balance to a measurement of one on a stand alone basis. The statistical correlation between the two properties has remained strong; it was .78 during the first analysis and has never been weaker since – the results below also feature a correlation of .78. A few necessary caveats before proceeding. The further down the rankings one goes, the less data available to rank languages by. The difference between spots #1 and #2, therefore, is much greater than #99 versus #100. Keep this in mind when perusing third or fourth tier languages. Exact placement is less important than tier. With that, here is the first quarter plot for 2013. Because of the number of languages now included in the survey and because of the nature of the plot, the above can be difficult to process even when rendered full size. Here then is a simple list of the Top 20 Programming Languages as determined by the above analysis. While there was effectively no change within the Top 10 languages – although it’s worth noting that Java picked up a ranking point since the last analysis, the only one in the Top 10 to do so – there was actually substantial movement in the bottom half of the Top 20. Shell lost ground slightly, dropping into an effective tie with Perl. Haskell likewise lost some ground. CoffeeScript, meanwhile, benefitted from a slight retrenchment of Visual Basic. Lastly, MATLAB knocked Groovy back one spot and vaulted into the Top 20, and is within two spots of its competitor R.
Notable performers outside of the Top 20 include Go, which jumped two spots to 28 (up from 32 in 2010), Ada which dropped four to 48, PowerShell which climbed two spots to 26 and Dart which jumped from 55 to 47, cracking the Top 50 for the first time. As cautioned, however, be careful about reading much into the lower rankings giving the small sample sizes involved. In general, we see the rankings more or less stratified at the upper levels. 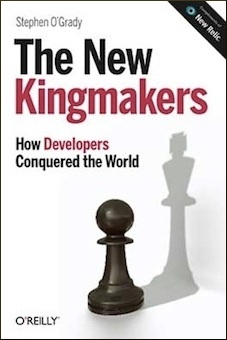 The obvious first tier of languages does not appear to be relinquishing its hold on developer time and attention – nor moving much within that tier, but competition outside of that area is fierce. This is particularly true in specialized domains, as with statistical analysis where R has seen steady traction but little growth with competitive platforms like MATLAB showing signs of improvement. Overall, however, the analysis of both language usage (GitHub) and discussion (Stack Overflow) confirms what we have been arguing for some time: that full scale fragmentation of language adoption is the new reality. Much as PaaS providers are currently grappling with the challenge of maximizing their addressable market via support for multiple runtimes, so too must vendors and projects in other categories work to service as many programming languages as possible. Given the opportunity to choose, developers are making choices: lots of them. I’m not convinced that “popularity rank” is right to say that people are doing lots of choices. My gut feeling is that more than 90% are using the top 10, so I’d like to see this graph with the real magnitudes. Can you please publish the raw data? Fascinating. I found one weakness – it only covers languages listed by github. There are 55 projects on github written in REALbasic but it’s not an official “language” on their list hence didn’t appear. You all should do this as a d3.js based live graphic. Would be much cooler and more interesting… and get a lot more hits. Io looks like an outlier in the stackoverflow/github ratio because the [io] tag refers to I/O questions. You want the [iolanguage] tag, which would put it down there near eiffel. You should weight StackOverflow Questions by their activity. When developing C# the big majority of questions had *at most* one answer and nearly no comments. Completely different with e.g. Python. It’s unclear, whether the languages are represented by the centers of the words or their beginnings. E.g., how Objective-C is located, in relation to C# and C++, on the GitHub axis. Adding dots for the actual positions would help significantly. As the “Nimrod” word is before 0, I think they are represented by their centers.